** Toothed brackets offer greater control when performing on-pole height adjustmentThis banner bracket holds a sign on a street pole! 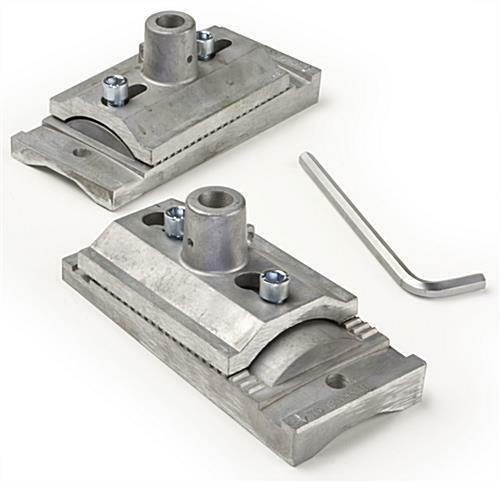 The product is a heavy-duty mount, built to last for years. The banner bracket, such as pennant hardware, is the perfect accompaniment to custom-designed lamppost sign. This flag mount, along with a graphic, is a unique marketing tool that is becoming an increasingly popular form of advertising. Restaurants, hotels, museums and other tourist attractions add the banner bracket to a street light pole outside their establishment to attract attention from passersby. 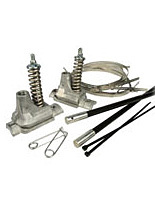 They are also ideal for colleges or universities, golf courses, or car dealerships. Communities attach this banner bracket to public light or lampposts with a sign to advertise anything from a local farmers' market to upcoming fundraisers or charity events. Whether implemented commercially or to announce town happenings, this mount hardware is a great choice for communicating to a large audience! 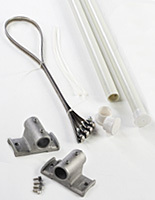 This street light mounting kit, banner bracket has all the hardware necessary for hanging one sign. To display double-winged flags, simply purchase two kits! 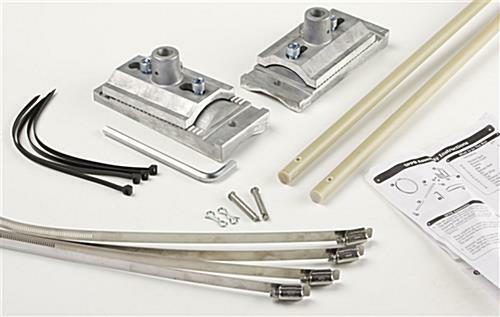 The main banner bracket components are cast aluminum and include toothed adjustments, so even after they are mounted to the light, the banners may be adjusted up or down up to 1-1/4"! This is a great feature to ensure a taught, non-sagging flag! 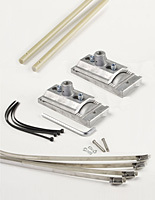 The (2) 24" poles included with the banner bracket set are crafted from fiberglass to withstand winds and extended use. 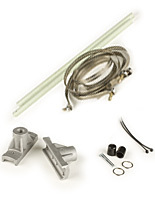 Four UV resistant zip ties, an Allen wrench (for adjusting the mount up or down on the light post), instruction sheet, and security pins are part of the assembly, as well. Finally, (4) screw gear bandings secure each banner bracket to the street light. This adjustable mount system allows each mount to fasten to uprights of varying shapes and sizes, even square or tapered poles! Product is as advertised. Very satisfied with the quality and apparent durability.